Boom Chiki Boom!!!! Are you familiar with OSMU? It's an acronym for One Source Multi Use which is currently a buzzword in Korean business. Boom Chiki Boom! is a good example of OSMU. Boom Chiki Boom! 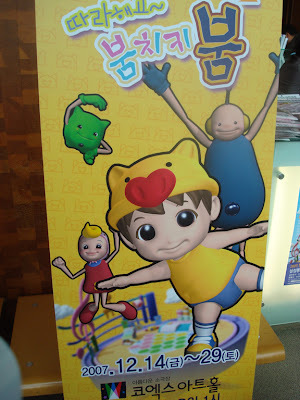 is a preschool program that encourages kids to dance and interact with the characters on screen. It promotes activity and health. Boom Chiki Boom! is used in many ways. It is a computer generated program as seen in the poster above. 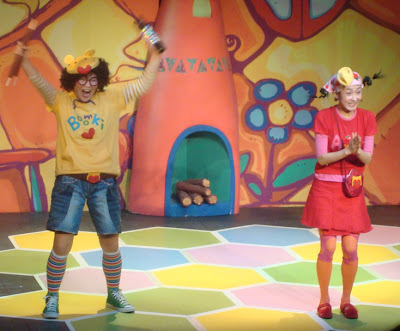 It is also a live-action show featuring actors in costumes. 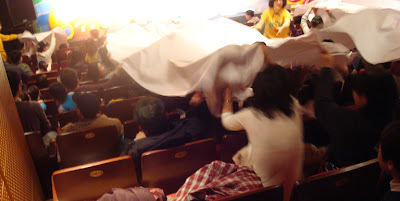 It is also a stage show performed for a live audience as seen above. Boom Chiki Boom! translates quite easily from screen to stage. 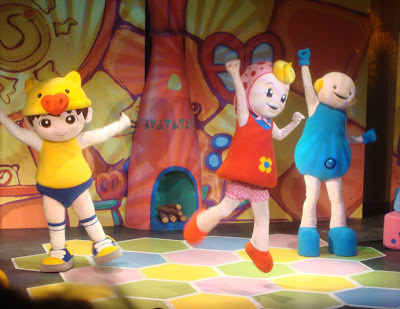 The same costumes and performers can be used, after all. 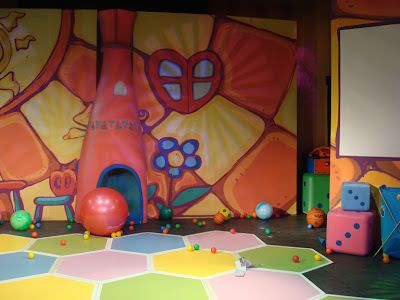 The sets and props are recycled for the stage show as well. 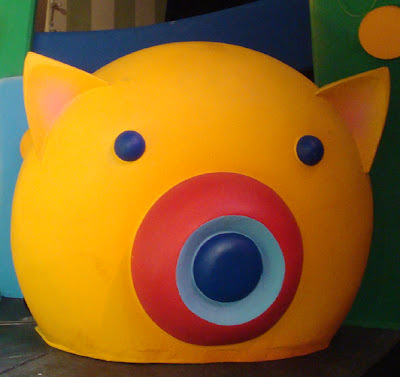 For example, this pig speaker from the original set is used for this stage show. In fact, it can also be found rendered in the computer generated show. This gold pig couch seemed irresistible and kids kept defiantly trying to sit in it without permission. One kid succeeded. And I think an adult tried, too! 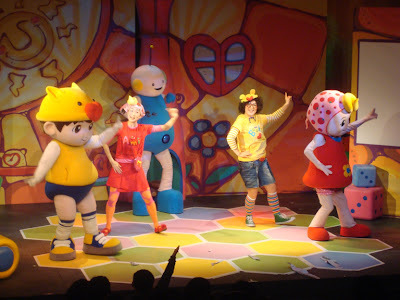 The stage show reuses the script and audio from the live-action costume show. The only major difference is these two hosts above. They exist solely in the stage show. They help make the performance more interactive and also to give the costumed performers some breaks inbetween "episodes". The hosts had lots of energy and made the audience really feel involved. 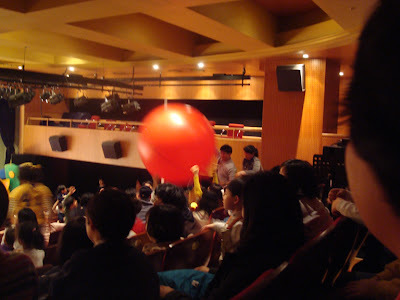 In a segment about balls, they bounced a big red ball around the audience. They also passed out small plastic balls to everybody. 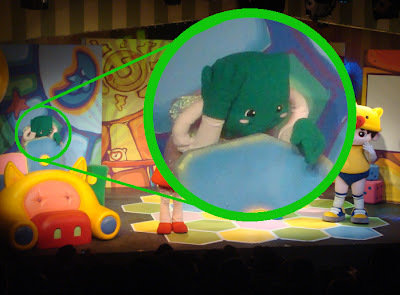 In a segment about paper, they spread giant sheets of paper over the audience. Then everybody was encouraged to shred it to pieces. They didn't have to tell the kids twice! 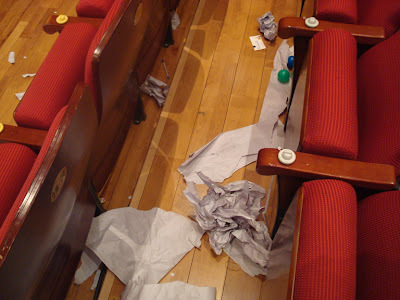 All that interactivity sure can leave a mess! The only element that doesn't translate well from the screen to stage is A-Do. 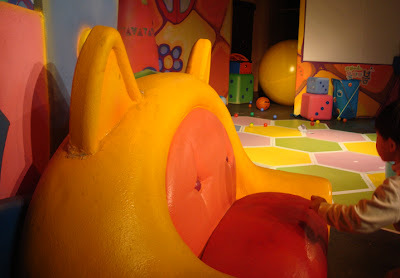 A-Do is a mischevious puppet who is puppeteered by someone hidden behind the pig couch. Unlike the television show, the audience can't see A-Do closely via camera zooms. This takes away some of his edge and charm. It's a shame, too, since he's my favorite character. Boom Chiki Boom! is a good example of creating a property and applying it many different ways. It's a young property, so I'm interested to see how it develops. I'm rooting for it since it is an original Korean property. 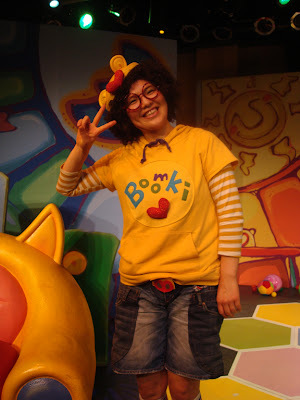 You can take a behind-the-scenes look at the English voice acting for Boom Chiki Boom! that I posted about previously.